"There's an awful lot of kooks in this hotel." 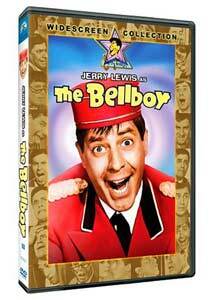 Here is Jerry Lewis at the apex of his fame—he not only stars in, but wrote, directed and produced The Bellboy—and, for good and for ill, it's pretty representative of Lewis's talents and limitations as a filmmaker. For all his notions of grandeur, it's pretty clear that he's not in the first tier with Chaplin and Keaton and the Marx Brothers; there's no shame in that, certainly. Jerry's best kind of funny is stupid funny, and if that's all right with you, this is a pretty fair way to yuk it up for an hour or so. We're warned from the jump, with an actor playing a Paramount exec delivering a prologue to us, and promising that in this movie "there is no story and no plot." What you'll find instead is a series of gags featuring Lewis as Stanley, a bellboy at the Fontainebleau hotel in Miami—Stanley is the current incarnation of the Lewis on-screen persona, a recurring character who is sort of a schnook, in comparison with, say, the Little Tramp. There are lots of silly, hoary old gags, but they've been around for so long because they always get a laugh—Lewis has great fun, for instance, with a variation on the old clown car, when dozens of the members of a movie star's entourage pile out of a tiny little sedan. You may not be surprised to learn that the movie star that that entourage is accompanying is Jerry Lewis, who comes to stay in Stanley's hotel—Lewis the filmmaker doesn't overdo it, but the gag becomes a lot funnier with the appearance of Milton Berle, also staying at the hotel, also with his own doppelganger bellboy. In these moments, in fact, Lewis is at his best, and seems to be having the most fun; you almost get a sense that, even though the breach with Dean Martin was irreparable, Lewis missed having a partner. Extras Review: Lewis is joined by Steve Lawrence for a very sparse commentary track; the latter didn't have anything to do with the film, but hey, he is half of Steve and Edie. Lewis gives a couple of details on the shoot, which took place almost entirely on location at the Fontainebleau, and the most interesting parts of the track are about the participation of Stan Laurel on the project, and the end of Lewis's longstanding handshake contract with Paramount; most of it, though, is either silence, Jerry admiring his own work ("This is one of the best visual jokes I ever saw") or Steve admiring Jerry�s work ("That�s wonderful"). Much more interesting is some archival material, including rehearsal footage (07m:19s) showing Lewis working with Winchell, goofing with a bank of phones, and doing his best as a prop comic in a nightclub scene, and a brief (00m:32s) blooper from Berle. There are also three deleted scenes (02m:42s), gags that didn't quite come off; Jerry reading from a letter from Stan Laurel (00m:31s); four promo spots (06m:20s), one of which features Winchell, the rest, Lewis. Aside from the original trailer, the best of all the extras is a very brief look at the Bellboy Bus Tour (01m:32s), silent footage of Lewis barnstorming the country to promote the picture; Jerry's son Chris Lewis provides some commentary, on his father's pioneering press junket. Not a grand or a great screen comedy, but it's got a handful of gags that are sure to make you laugh out loud, and at less than an hour and fifteen minutes, you'll be checking out before you know it.